For use as adjunctive therapy in the treatment of irritable bowel syndrome (irritable colon, spastic colon, mucous colitis) and acute enterocolitis. May also be useful as adjunctive therapy in the treatment of duodenal ulcer. IT HAS NOT BEEN SHOWN CONCLUSIVELY WHETHER ANTICHOLINERGIC/ANTISPASMODIC DRUGS AID IN THE HEALING OF DUODENAL ULCER, DECREASE THE RATE OF RECURRENCES OR PREVENT COMPLICATIONS. Inactive ingredients: Anhydrous Lactose, Calcium Stearate, Colloidal Silicon Dioxide, Corn Starch, and Microcrystalline Cellulose. This drug combination provides natural belladonna alkaloids in a specific, fixed ratio combined with phenobarbital to provide peripheral anticholinergic/antispasmodic action and mild sedation. Glaucoma, obstructive uropathy (for example, bladder neck obstruction due to prostatic hypertrophy); obstructive disease of the gastrointestinal tract (as in achalasia, pyloroduodenal stenosis, etc. ); paralytic ileus, intestinal atony of the elderly or debilitated patient; unstable cardiovascular status in acute hemorrhage; severe ulcerative colitis especially if complicated by toxic magacolon; myasthenia gravis; hiatal hernia associated with reflux esophagitis. 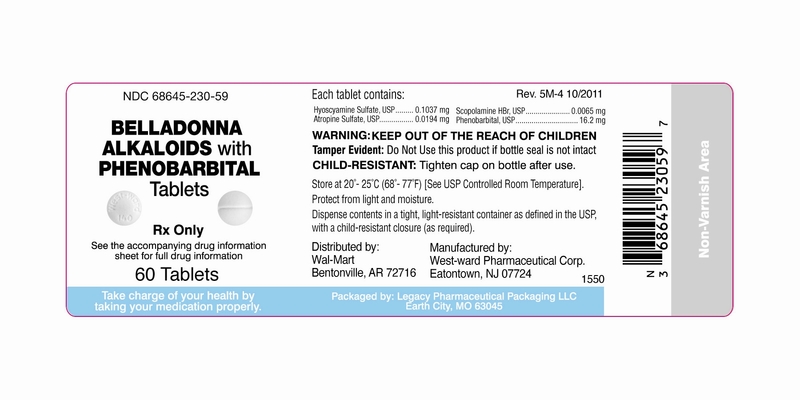 Belladonna alkaloids with phenobarbital tablets are contraindicated in patients with known hypersensitivity to any of the ingredients. Phenobarbital is contraindicated in acute intermittent porphyria and in those patients in whom phenobarbital produces restlessness and/or excitement. In the presence of a high environmental temperature, heat prostration can occur with belladonna alkaloids (fever and heatstroke due to decreased sweating). Belladonna alkaloids with phenobarbital tablets may produce drowsiness or blurred vision. The patient should be warned, should these occur, not to engage in activities requiring mental alertness, such as operating a motor vehicle or other machinery, and not to perform hazardous work. Phenobarbital may decrease the effect of anticoagulants, and necessitate larger doses of the anticoagulant for optimal effect. When the phenobarbital is discontinued, the dose of the anticoagulant may have to be decreased. Phenobarbital may be habit forming and should not be administered to individuals known to be addiction prone or to those with a history of physical and/or psychological dependence upon drugs. Since barbiturates are metabolized in the liver, they should be used with caution and initial doses should be small in patients with hepatic dysfunction. Use with caution in patients with: autonomic neuropathy, hepatic or renal disease, hyperthyroidism, coronary heart disease, congestive heart failure, cardiac arrhythmias, tachycardia, and hypertension. Belladonna alkaloids may produce a delay in gastric emptying (antral stasis) which would complicate the management of gastric ulcer. Theoretically, with overdosage, a curare-like action may occur. Animal reproduction studies have not been conducted with belladonna alkaloids with phenobarbital tablets. It is not known whether belladonna alkaloids with phenobarbital tablets can cause fetal harm when administered to a pregnant woman or can affect reproduction capacity. Belladonna alkaloids with phenobarbital tablets should be given to a pregnant woman only if clearly needed. It is not know whether this drug is excreted in human milk. Because many drugs are excreted in human milk, caution should be exercised when belladonna alkaloids with phenobarbital tablets are administered to a nursing mother. Adverse reactions may include xerostomia, urinary hesitancy and retention; blurred vision; tachycardia; palpitation; mydriasis; cycloplegia; increased ocular tension; loss of taste sense; headache; nervousness; drowsiness; weakness; dizziness; insomnia; nausea; vomiting; impotence; suppression of lactation; constipation; bloated feeling; musculoskeletal pain; severe allergic reaction or drug idiosyncrasies, including anaphylaxis, urticaria and other dermal manifestations; and decreased sweating. Elderly patients may react with symptoms of excitement, agitation, drowsiness, and other untoward manifestations to even small doses of the drug. Phenobarbital may produce excitement in some patients, rather than a sedative effect. In patients habituated to barbiturates, abrupt withdrawal may produce delirium or convulsions. The dosage of belladonna alkaloids with phenobarbital tablets should be adjusted to the needs of the individual patient to assure symptomatic control with a minimum of adverse effects. Adults: One or two tablets three or four times a day according to condition and severity of symptoms. The signs and symptoms of overdose are headache, nausea, vomiting, blurred vision, dilated pupils, hot and dry skin, dizziness, dryness of the mouth, difficulty in swallowing, CNS stimulation. Treatment should consist of gastric lavage, emetics and activated charcoal. If indicated, parenteral cholinergic agents such as physostigmine or bethanechol chloride, should be added. Belladonna Alkaloids with Phenobarbital Tablets are supplied as; White, round, scored, compressed tablets imprinted â€œWest-ward 140â€. Store at 20 â€“ 25° C (68- 77°F) [See USP Controlled Room Temperature]. Protect from light and moisture. USUAL ADULT DOSAGE: See accompanying product literature for complete information. Store at 20 â€“ 25° C (68- 77°F) [See USP Controlled Room Temperature].